Hey lovelies, I've stumbled on a few cool sites lately, and thought I would share the love with you! Slimkicker.com, it's a free "level-up" website and app that was released recently. Basically, you can track your food, workouts and complete challenges for points that allow you to level up and win prizes. healthier: sustaining motivation. Many people makes resolutions to stop eating junk, or start going to the gym every New Year. But once March or April hits, we forget about our goals, and return back to our old ways. That's why we created SlimKicker, a level-up game and point-based program. You start by tracking your diet, where whole foods are worth more points than processed foods. It's similar to Weight Watchers, but in reverse. But diet, and fitness are half of the battle. Most people regain weight because they never learn long-term habits. We solve this by taking habits as quitting soda, and turning them into 7-30 day challenges. Like a regular game, the challenges start out easy, and gradually become harder, with more points. We encourage you to check-in daily with others doing the same challenge for accountability and social support." Chickbands, non-slip headbands for girls on the go! I am super excited to have won a chickband from a blog giveaway that Ashley of Adventures of Newlyweds hosted last week! I chose a super skinny black sparkly band, and know it will be a staple of my workout attire. I love a good no slip band that keeps my bangs and shorter layers out of my face when I am running or working out. Head on over to the Chickbands etsy site and pick up a reasonably priced headband for yourself! "We Blog. We Tweet. 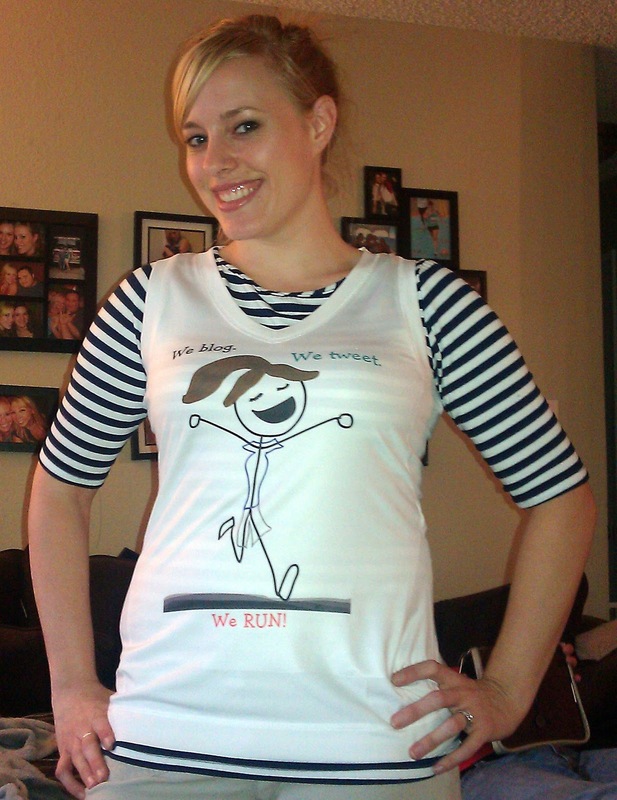 We Run" tech tank from Julie of Tri-ing to be Athletic on Zazzle. 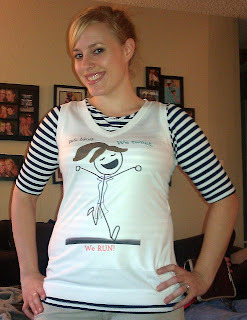 I just got mine in the mail and I can't wait to wear it at Rock n Roll Seattle half marathon in June with all of my blogging and running buddies who are running the race with me. First thing I did when the package arrived was throw it on over my clothes and make Billy snap a photo for me. Nice look, right? You can order yourself an awesome tee by clicking the link above. Hormonal body fat signatures article. I found this article on Facebook from the Recipes for Gals in figure and bodybuilding page by Jen-Fit, and had to share. It's about how different types of food release different hormones in your body, which can aid or impair your weight loss and fitness goals. Totally worth reading if you are in to the nerdy science behind your food choices and how they affect your body, and how a cookie cutter diet won't work for everyone. Kiki la'Rue do you all know about this awesome online clothing retailer? Just discovered it, thanks to Ashley again, and am loving all of the awesome pieces! I will definitely be making an order soon to spruce up my summer wardrobe. Super. Cute. That's all for now! Go explore and learn something, buy something, or just plain have fun! That tank is so cute and fun! LOVE kiki la rue also, such fun dresses!! the chick bands are so cute!! i want to order some for work outs. and i love the new tank, even over the shirt aha - love her blog!